You are currently browsing the category archive for the ‘iPad’ category. Our consumer health editor, Jackie Wehmueller, had turned up a promising opportunity. She had contacted a prominent dermatologist about writing a book on chronic itch, a condition that affects millions of individuals. The market potential for the book was enormous and the dermatologist was renowned. He liked the idea and agreed to write the book with one key condition: it had to be a fully interactive e-book with patient videos and three-dimensional graphics, and it had to be published as a multi-touch iBook. The author was coming to Baltimore in a few weeks. Did we want to meet with him and learn more? The answer was an enthusiastic yes. As a longstanding publisher of titles in consumer health—including the bestselling Thirty-Six Hour Day—the Johns Hopkins University Press was the natural home for this path-breaking project. There was a small twinge of anxiety over the fact that we had never before used iBooks Author—the multi-touch platform that seamlessly incorporates video, audio, 3-D graphics, and other interactive features directly into the e-book file—but that kind of anxiety is familiar in an industry where change is the only constant. “We’ll figure it out,” we said, and quickly got to work. 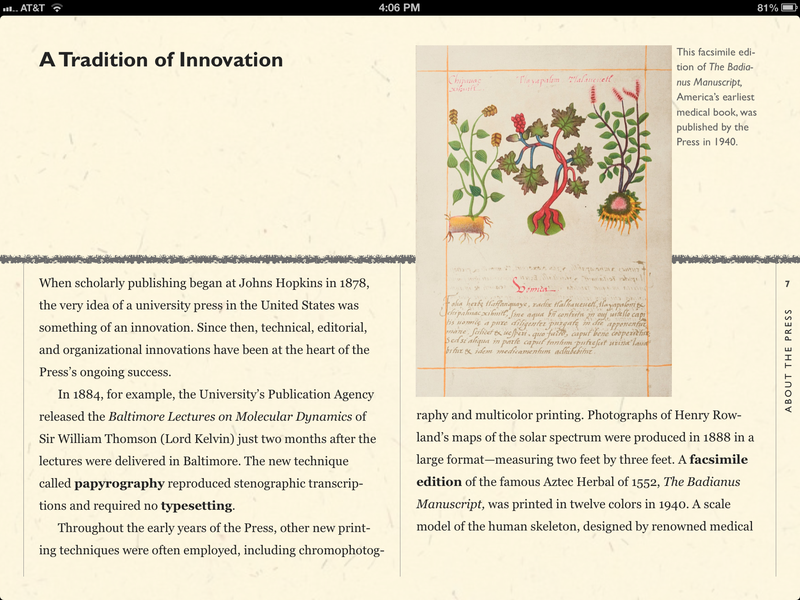 JHUP medical publishing: from manuscript to iBook. Figuring it out is the charge of the Online Books Division (OBD)—a big name for a three-person operation within JHUP’s Books Marketing Department. We seek commercially promising opportunities for digital innovation and figure out how to integrate them into the Book Division’s workflow. Since 2010, we’ve developed and posted supplemental material on CD and online for dozens of titles, we’ve incorporated 3,000 new pages to our online reference, The Early Republic, and we published the 2nd edition of the Johns Hopkins Atlas of Digital EEG (a proprietary software product accompanied by a print book). We’ve also digitized our course adoption campaigns, expanded and refined our list-serv, and segmented 20,000 e-mail subscribers by subject area preference—all while adding new vendors and territories to our e-book program. We’ve learned a few things along the way, perhaps nothing as important as this: innovation requires not only a willingness to learn, but a stomach for frustration and occasional failure. It requires us to engage fully with that which we do not know, and to begin anew the long journey of mastery. It requires us to add new challenges to already heavy workloads, disrupt routines, and make new kinds of mistakes. And sometimes it requires that we say “yes” to a project before we are 100% certain that we know exactly how to get it done. A couple of weeks in advance of the author meeting, two members of the OBD staff—Claire McCabe Tamberino and Michael Carroll—enrolled in a two-day training course on iBooks Author. They came back full of enthusiasm for the platform and confident that we could master it quickly. We all agreed that we needed a beta project that would allow us to become proficient with iBooks Author in advance of using it for our first commercial endeavor. The search for a practice project came in the midst of a press-wide strategic communications discussion, in which we had identified the need for multi-media collateral material for JHU Press. 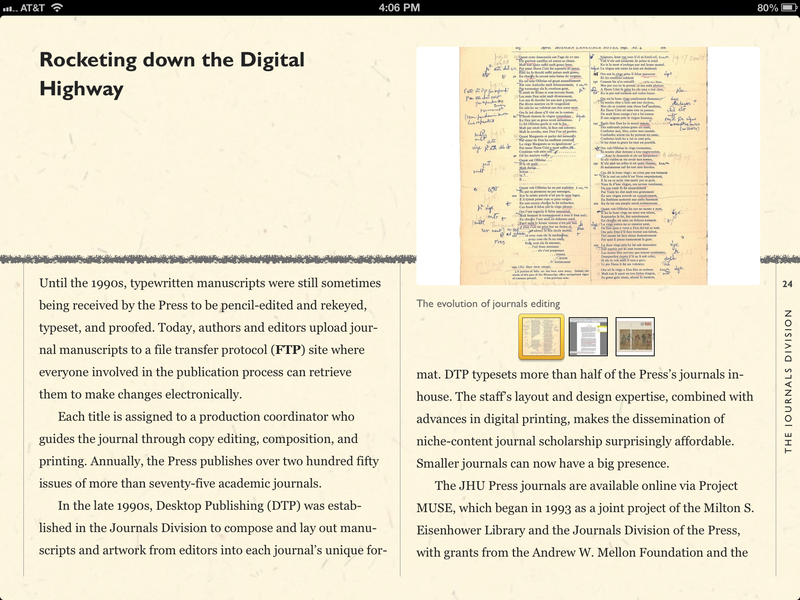 That’s when it hit us: why not use iBooks Author to develop a multi-touch iBook about the Press? 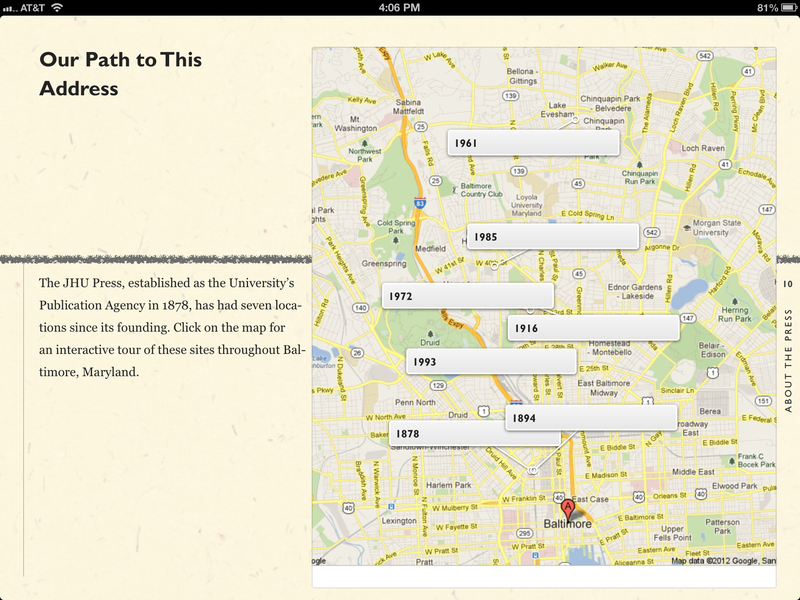 Interactive maps invite readers to explore the history of the press. With that, Meet the Johns Hopkins University Press was born. The vision was simple enough: repurpose descriptive copy about the Press and its four divisions—Books, Journals, HFS, and Project MUSE—and enhance it with multimedia. Inspired by the video UNC Press had recently released to highlight the appointment of director John Sherer, we decided to conduct video interviews with Press leaders. That’s where things got a little tricky. We didn’t have a resident videographer on staff, and we couldn’t afford the steep rates charged by the university. So we decided to do it ourselves. The shooting went smoothly enough, but we quickly discovered two unanticipated problems. First, the interviews were far too long. Second, the video quality was compromised by the lack of professional lighting. Reshooting all of the interviews simply wasn’t an option. We were already on a tight schedule and the budget was even tighter. They say necessity is the mother of invention. In this case, it led to creative thinking and innovation. We decided to shorten the video interviews considerably, and since the audio quality was better than the video quality, we decided to use small snippets of video, then continue the audio with still shots and animated B-roll. Nearly a dozen people came together to finish the project. We published Meet the Johns Hopkins University Press in April and made it available free of charge in the iTunes store. We’ve been using it to introduce the Press to university stakeholders, prospective clients, funders, and authors, and the reaction to it has been overwhelmingly positive. Meet the Johns Hopkins University Press helped us achieve our primary goal: becoming proficient in iBooks Author in advance of our first commercial project, Living with Itch, which will be published in August (more on that project in a future column). But the beta project bestowed some additional benefits that we found instructive. First, we gained confidence in our ability to master new ways of publishing. When faced with a challenge like publishing in iBooks Author, it can be easy to assume that we aren’t big enough to handle it, that such opportunity is better left to trade houses and large commercial publishers. That simply isn’t the case. University presses are staffed by smart, adaptable professionals who master new challenges every day. Why worry that we can’t when we demonstrate day after day that we can? Second, the project forced us to share information across divisions, a process that has been encouraged via our Press-wide strategic messaging efforts. Not only is it interesting to learn more about the work of our colleagues, but this kind of information sharing helps us leverage our collective strength and identify new responses to industry and market challenges. Third, we were reminded of the value of professional services. Sure, we can shoot and edit video on the iPad, but it isn’t going to be of the same quality as work from professional videographers. For future book-length projects requiring video, we’ll ask the author to deliver high-quality video or we’ll hire a pro. A stop on JHU Press’s digital journey. Meet the Johns Hopkins University Press incorporates the multi-touch functionality of iBooks Author, with text, three-dimensional graphics, interactive maps, video, audio, and a self-grading quiz. If you’d like to see it for yourself, go to the iTunes store and download a free copy. We’d love to get your feedback. Feel free to email Claire McCabe Tamberino with your comments and questions at cmt@press.jhu.edu. And watch this space for a future column on Living with Itch: A Patient’s Guide and an update on how we’ve used Meet the Press in our strategic communications. There’s a very useful review of some of the various ebook apps available for the iPad by Glenn Fleishman over at TidBITS. It’s well worth a look.